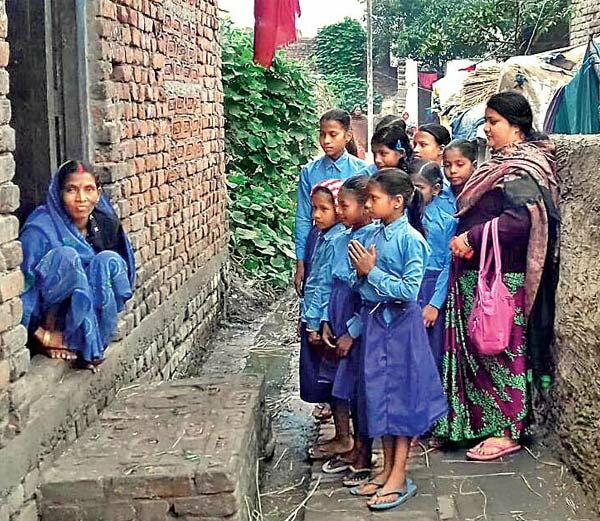 PATNA: Thousands of students enrolled in government and private schools have been given a fairly unique ‘homework’ — arrange for toilets at home, compulsorily! Authorities said the Patna Municipal Corporation has issued letters to all schools, wherein all its enrolled students have been told to submit an affidavit saying they have toilets at home. The printed affidavits to be signed the students say that none of their family members go out to defecate, in the open! The students have to submit the signed affidavits to their schools within a fortnight. The move is part of the strategy to help declare Patna, the capital of Bihar an “open defection-free” state very soon. “We are sending necessary instructions to every school, as directed by the Patna Municipal Corporation. Every school will have to get written affidavits by the students regarding the availability of toilets at home,” Patna district education officer Jyoti Kumar told the Gulf News over phone on Friday. He said it would consume a lot of time to visit every house and convince the people to arrange for toilets at home. “So, we thought this could be a better idea to convey sanitation-related message to every home, through the children,” the official added. The order has put many students in danger of losing their education, as most of them are from poor backgrounds and don’t having toilets at home. Bihar remains one of the worst performers in toilet construction. As per an official report, around 16.5 million households out of over the state’s 110 million population currently do not have toilets at home, forcing people to defecate in the open. Right now, only 308 villages out of the over 44,000 in Bihar have been declared free from “open defecation”, according to an official report. With toilets still out of reach for a huge number of villages, authorities in the state have adopted various measures to render better access to toilets for villagers. Last year, the education department asked schoolteachers to make rounds of the rural areas, both in the morning and the evening, to spot any anyone defecating in the open and click photos of them, in order to “shame them”. Authorities have also formed a committee of four to five teachers in the respective areas, to monitor the cleanliness drive’s progress. The move drew bitter criticism, ultimately forcing the authorities to cancel the order. A report from the Centre for Science and Environment (CSE), a New Delhi-based research and advisory body, also presents a terrible picture of Bihar on the sanitation front. According to its study, around 99 per cent of the state’s expenditure has gone into constructing toilets. However, the abysmal quality of the toilets built meant they are not used much. “Bihar has converted less than 1 per cent of the total dysfunctional toilets in the country into functional ones,” said Sushmita Sengupta, lead researcher of the CSE study. CSE’s research findings further state that the target of 100 per cent household toilet coverage in Bihar could happen only by 2033, given the current rate of toilet construction.